Here’s something I’ve been wanting to try for awhile. 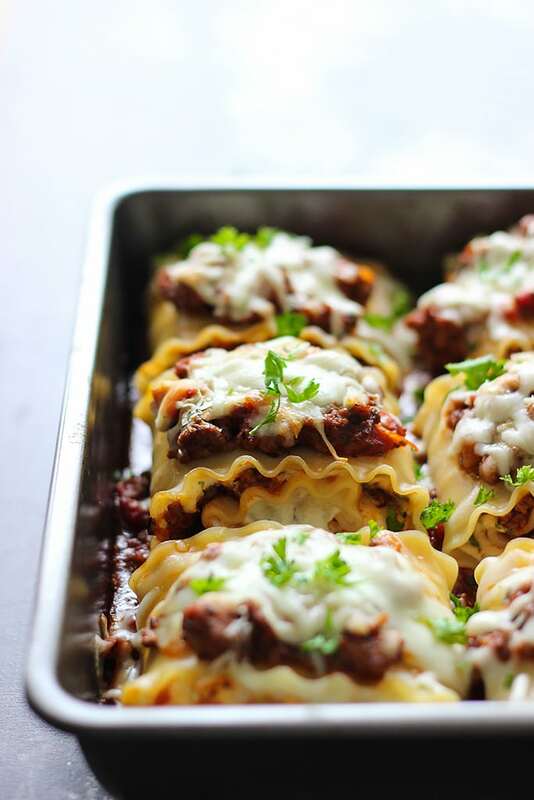 It seems like a fun way to serve up individual sized servings of lasagna. 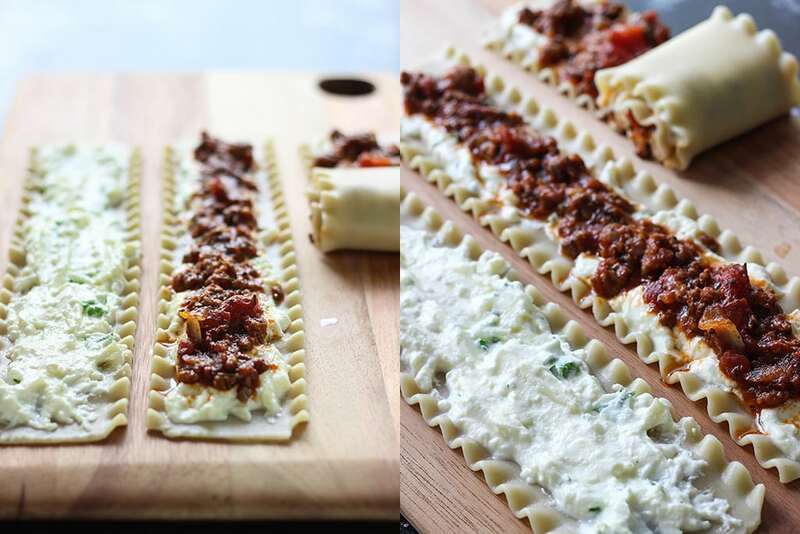 So today we’ll be making some lasagna roll ups. Double stuffed with a layer of ricotta filling and a meat lover’s beef and Italian sausage layer. Then lovingly topped with mozzarella and Parmesan cheese. It’s really, really delicious. I tweaked the meat sauce a little to my liking, so you can expect the same flavor profile from my slow cooker beef and cheese pasta and baked ziti. So if you loved either one of those, you’ll love this. 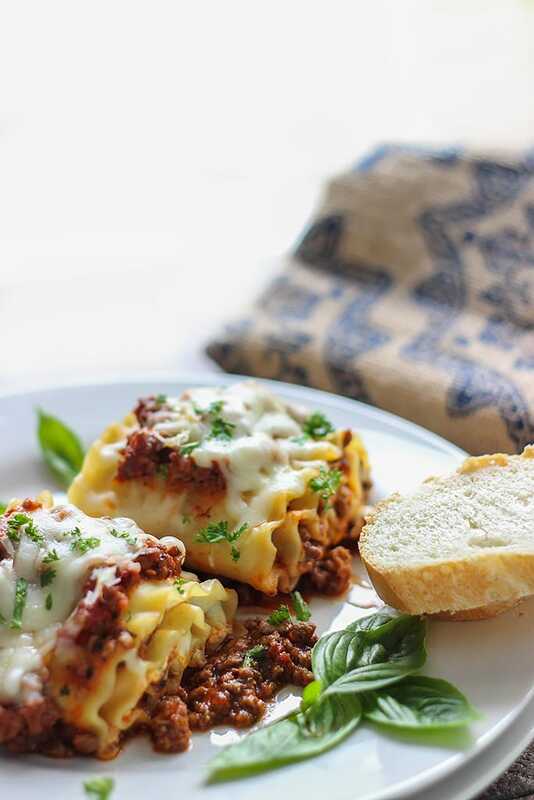 Like your typical lasagna, be ready for lots of prep work but I think it’s worth it. It’s definitely not a recipe for beginner cooks but I hope I’ve broken it down enough to make this relatively easy. 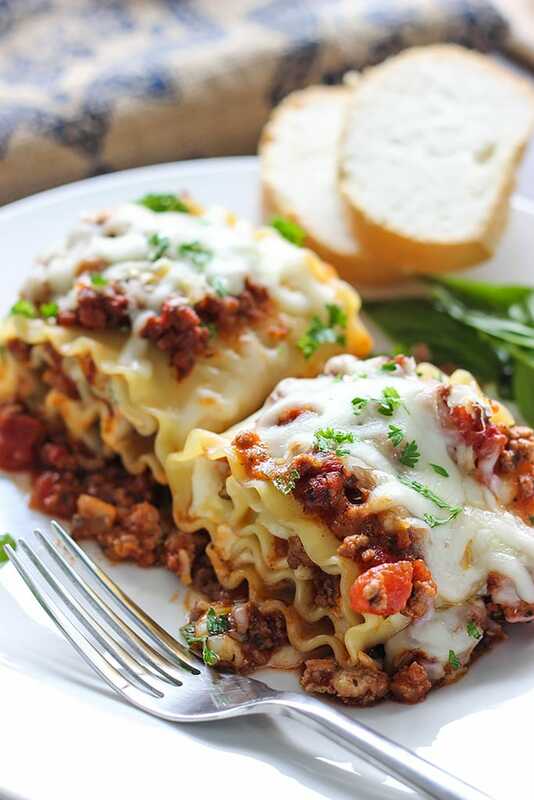 This will serve about 12 individual servings of lasagna roll ups so it’ll feed a crowd. Or last a couple of days for your average sized family. We start by boiling the lasagna noodles according to the package directions. I used a little olive oil into the water to stop the noodles from sticking together while cooking. My biggest fear throughout the whole thing was having noodles stuck together or breaking apart. A little bit of oil in the water and rinsing it off under cold water later should take care of this. While the noodles are cooking, we can start making the meat mixture. Brown the ground beef and Italian sausage in a non-stick pan over medium high heat. You’ll want to break up any clumps so you have a nice smooth sauce. 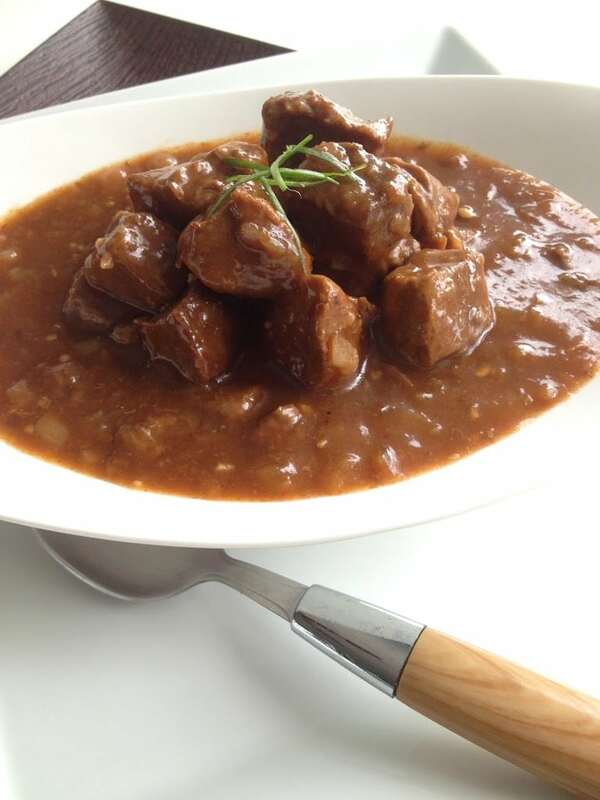 Once it’s cooked, remove any rendered fat and remove the beef mixture from the pan. Saute your onions and garlic until translucent and reintroduce the meat back into the pan. Add your marinara sauce, stewed tomatoes, seasonings, Worcestershire sauce, beef bouillon cube, sugar and salt and pepper to taste. I like to add a little sugar to my marinara sauce to balance out the acidity of the tomatoes. Make sure to break up the tomatoes in the sauce as well. Do a taste test and adjust the seasoning to your liking then lower the heat and let the meat sauce simmer while you start the ricotta mixture. I’d like to stress that you shouldn’t skimp on good quality ricotta cheese as it can make or break a lasagna. Get some good ricotta! Combine all the ingredients in the cheese mixture and set aside. By now, your noodles should be cooked. Drain them and rinse them under cold water. Rinsing them will stop them from sticking together and also stop the cooking process which works out great since it will cook more in the oven and you don’t want soggy noodles. After rinsing, I used a paper towel-lined plate to line up three noodles, covered it with another paper towel and lined up three more noodles until they were all stacked. I found this the best way to stop them from sticking together while preserving precious counter space. Here’s where we’ll start rolling. I lined up three noodles on a chopping board and prepped them in batches of three. 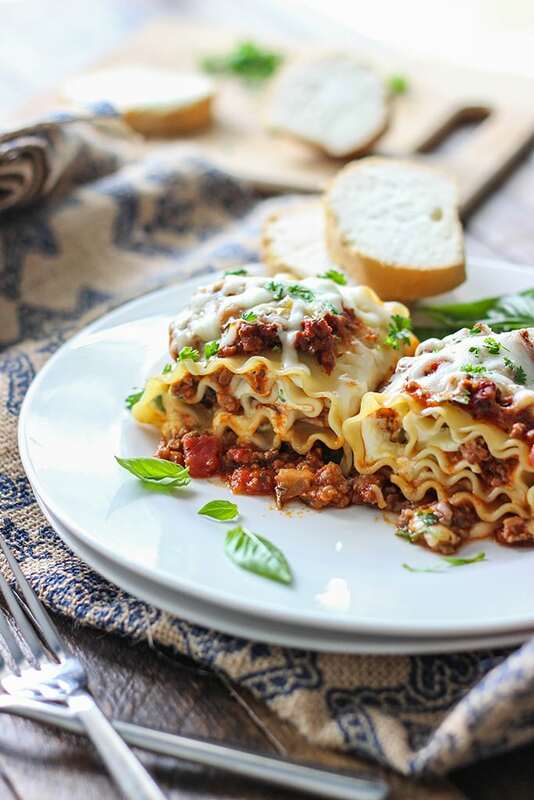 Spread a thin layer of the cheese mixture on each lasagna noodle from end to end. You should allot about 1/4 cup of the cheese mixture to each noodle. It was easier to use the back of a spoon to spread them out. Then top with about two tablespoons of the meat sauce. Spread them out again from end to end. Make sure not to overstuff the noodles as the fillings will spill out from the sides once you roll. One thing I found out was to focus more of the filling towards the first half of the noodles where you’ll start rolling. Rolling them up will end up spreading the filling towards the end of the noodle so it all works out. Just remember to roll them up gently and don’t apply too much pressure. It’s okay if you’re messy, I made mine super neat so folks could see what they were getting instead of having big red blobs of food. Also follow the natural way the lasagna wants too roll with how much stuffing it has and don’t force them into super tight rolls. All 12 of them should fit nicely in a standard sized baking pan. I tried it with a 9×13 casserole dish but it was way too tight. 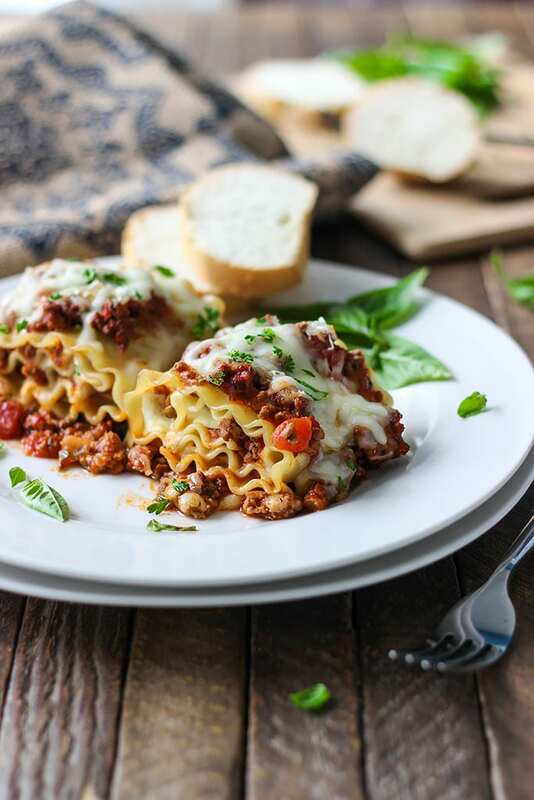 Spread two cups of the meat sauce on the bottom of the pan and then arrange your rolled up lasagna noodles seam side down. I ended up having rows of three by fours. Top each noodle with remaining meat sauce, it should be about one tablespoon per noodle. Then finish up with leftover mozzarella and Parmesan cheese spread out among the noodles. Feel free to add more cheese on top if you want an even cheesier layer. Bake it uncovered at 350 degrees F for 30 minutes and you’re pretty much done. Serve them hot with some garlic knots and a salad! PS: I’ve combined the quantity of cheese needed under ‘cheese mixture’ so you can add it easily to your shopping list. But take note that the mozzarella and Parmesan cheese is divided. Only some of it goes in the actual cheese mixture and remainder is used to top the noodles before baking. Hi Farah! These are making me hungry! Good, whole milk ricotta is a must! Skim and non fat have NO taste! I use ricotta in my mac ‘n cheese, along with good sharp cheddar and Parmesan. I learned the hard way on how good quality ricotta can make or break a lasagna. Used to buy the store brand to save some money but never again! It’s really amazing how much a difference it makes and one of the examples of the saying ‘You get what you pay for’. Never tried ricotta in my mac and cheese though! This really cracked me up. “Farah-ziti”! I mean, at home I dub a spaghetti sauce I make as ‘spaghetti ala Farah’ (which has Worcestershire sauce of course) but this would probably be the first time someone from the blog has done this! I love it and I’m still grinning days later! But I love this one so much, I’m thinking of making it a staple. 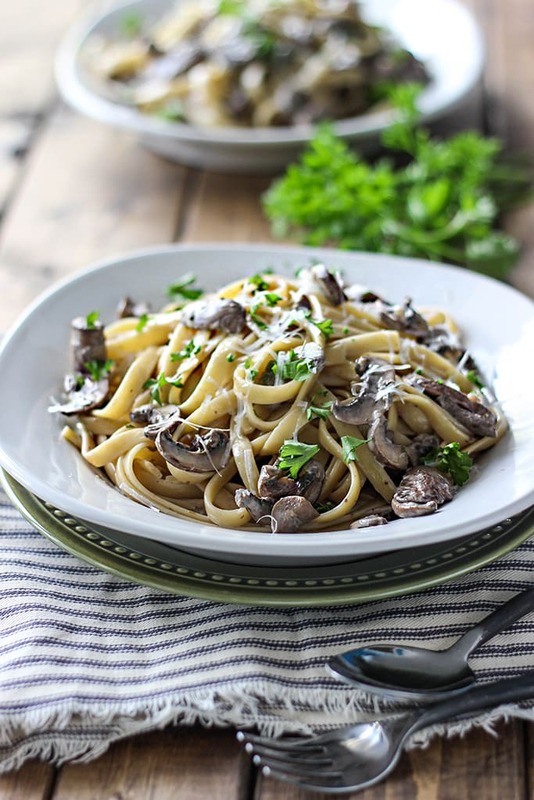 It was so easy to reheat and a mood booster for lunches! 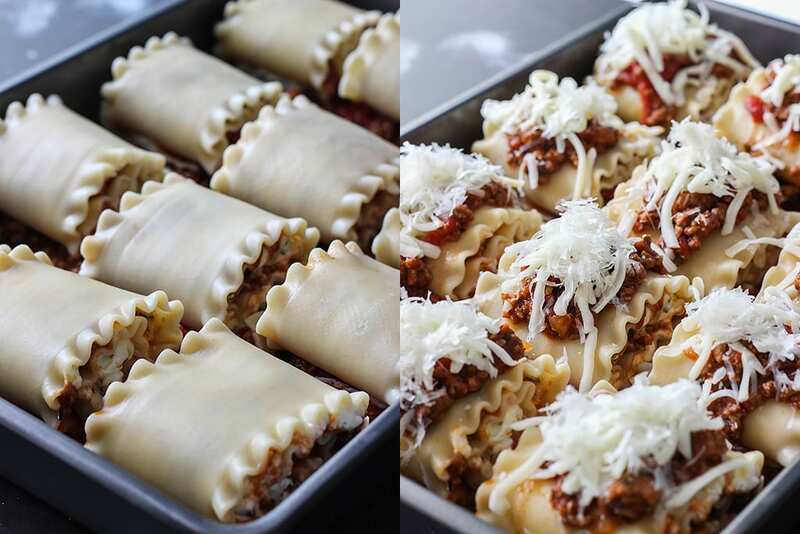 I made your lasagna roll ups last week. 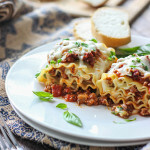 I had made lasagna roll ups before with another recipe, but couldn’t locate it. 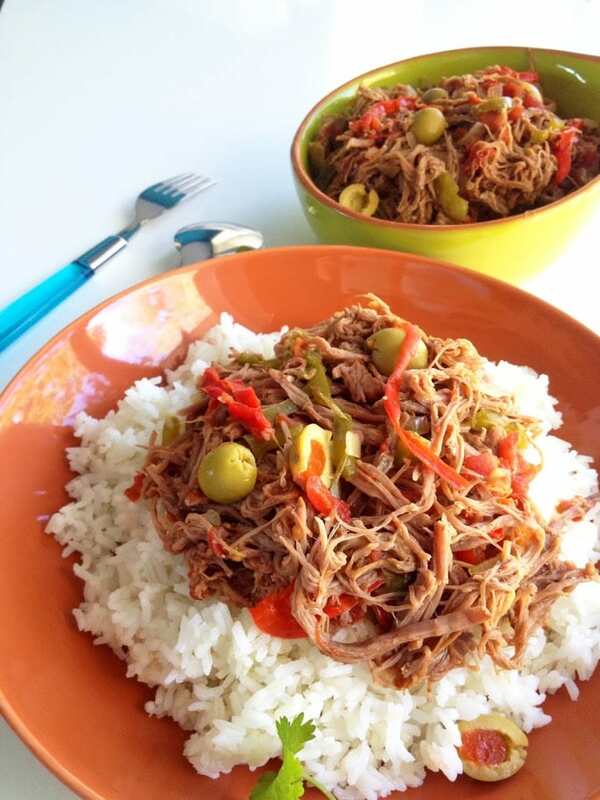 So, I found your recipe on Pinterest and it was very similar to the other one I liked. But yours is so much better! It was so, so tasty! Everyone raved about it. Maybe it was the red pepper flakes…anyway, this will be my forever lasagna recipe. Thank you!